Strange Brewing Uonuma Yuzu Saison is a 6% fruit beer / saison from Strange Brewing, based in Uonuma, in Niigata, Japan. It’s part of their draft only range and is brewed using locally grown yuzu, also known as Japanese citron. 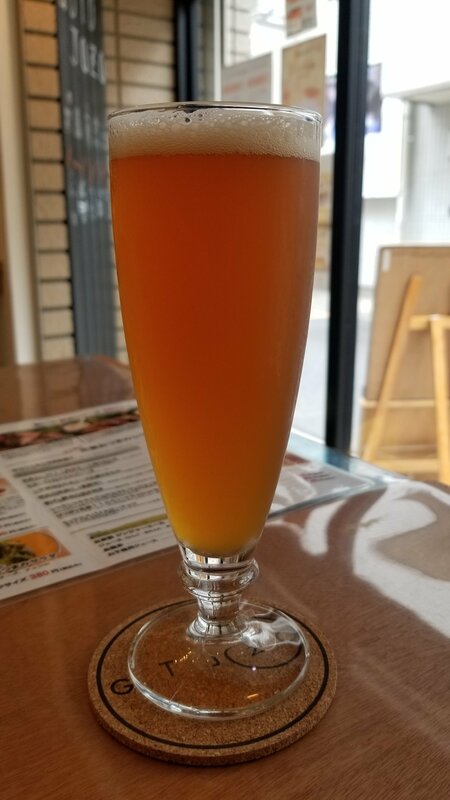 Strange Brewing Uonuma Yuzu Saison came up a dark orange with hints of brown and a slightly off-white head. The head collapsed fast on itself to leave a ring of bubbles around the edge of the glass. Strange Brewing Uonuma Yuzu Saison just reeked of yuzu really – no subtlety to it. Just boom. Yuzu in your face. Once that had been overcome, then some dry Belgian yeast funk came through but not enough to really overcome the yuzu aroma. The body was more of the same. Yuzu, yuzu, and a bit more yuzu, with a residual caramel sweetness. If this was supposed to be a saison, then it was too dark and too sweet really. The yuzu flavours just dominated throughout drinking and towards the end made it had to drink. Strange Brewing Uonuma Yuzu Saison had a caramel yuzu aftertaste to it that was sticky and sickly sweet. Strange Brewing Uonuma Yuzu Saison is a not a good yuzu beer or a good saison. Give it a miss.